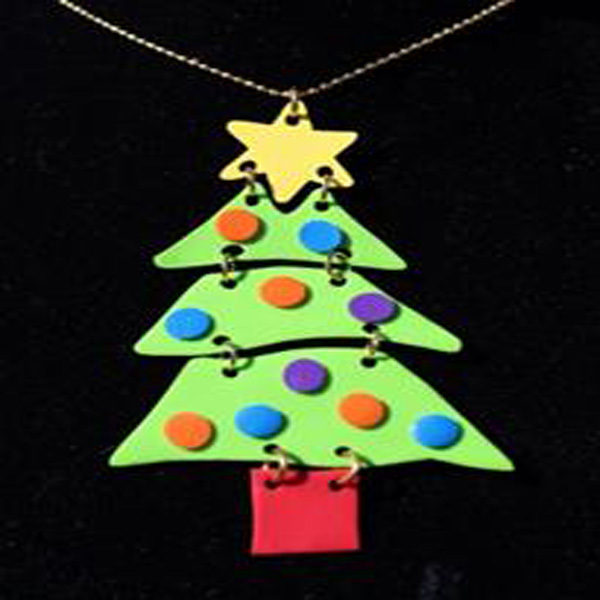 Project Description: Learn how to custom make your own funky Christmas tree pendants that your loved ones will go crazy for! Trace or print template on following page on card stock. Cut out pieces and trace them onto the Shrink Film: tree – green, star – yellow and stand – red. Cut pieces from Shrink Film and punch marked holes (use 3/16” to ¼” size punch). Punch ornaments from Orange, Blue and Purple Shrink Film using ½” circle punch. Bake all pieces according to package directions. Attach pieces using jump rings. Glue on ornaments; set aside for glue to set. Hang pendant from bead chain.